I used to hate it in elementary school when teachers assigned us to do a project on our family heritage. The Italian kids would come in with some amazing pasta dish, the Chinese kids with their kimonos, the Russian kids with those nesting dolls that fit into each other. And then there was me, about 1/4 Irish, and then 1/8 of each German, Scottish, French Canadian, Austrian, Native American, and English, with not a clue of what to bring to school. It seemed everyone had a cool culture that they were a part of with souvenirs to show, songs to sing, and food to eat. The coolest cultural thing my family did was wear green on St. Patrick's Day. But then, I moved to NYC. All my friends were suddenly very different from me and very proud of their heritage. Again, I felt that uncoolness I experienced as a second grader. I felt average for being straight-up plain American. And now I'm miraculously included in this theatre company whose mission is to diversify casts and blend cultures. There's Larissa from Brazil, Nick from Hong Kong, Leo whose parents are straight off the boat from Greece, Lauren from St. Louis, who is pretty much my first black friend, Renee with her inherited Latino feistiness, Sergio who speaks Spanish at home with his family. And then there's me...who wears green on St. Patrick's Day. But I've since grown out of those feelings. If an elementary school teacher asked me to do a project on my family heritage now – I'd tell her to go check out Plutus. My new family and my new home is here in New York, and my new culture is a blend of my life as a working actor in the most diverse city. Because here I’ve found that I’m not just average. I’m not just defined as a white girl. I am actually the manifestation of what our city - and our company - represents. I am a melting pot of many cultures. I am diverse. 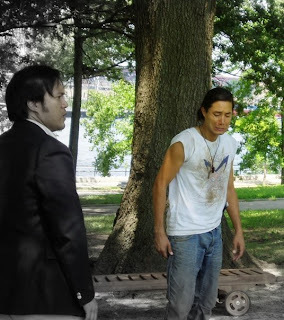 Just as each actor and crew member brings a different culture to the table, I am bringing those seven different cultures from my ancestors, and my newfound New York City culture. In embracing that, I can really go to the extremes with cultural references in our adaptation of Plutus. It has been so much fun to make Greek references in Astoria Park. They loved it when I mispronounced “mousaka” (yes, on purpose, only because I honestly, truly, cannot pronounce the word), and told a character “Voulusette,” which means “Put a sock in it!” And the predominately Latino audience in Inwood Park roared with laughter when Sergio’s guitar-playing character breaks twice to complain in Spanish. Curious Frog is a company that accurately represents New York City – the company is a melting pot of cultures, comprised of a cast and crew who represent ideas from all over the world traveling to all corners of the city. How fitting for a NYC theatre company to represent the dynamic of its city's population and history. We are able to take risks with our work, to expose people to cultures other than their own, and to truly embrace collaboration in its most diverse potential. 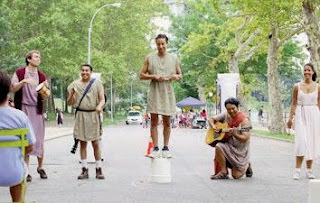 The awesome thing about our summer "traveling troupe" is that we perform in the different boroughs of the city - playing to audiences of different races, religions, and ethnic backgrounds. Every park has its own unique culture, and here we are an ensemble of many different cultures, working together. I can only hope that every park recognizes this collaboration - and maybe they too will branch out into a new park as we have done. - Jodie Pfau plays Cario in Curious Frog's summer family show, Plutus, which closes Saturday, September 19th at Queensbridge Park in Queens. www.curiousfrog.org for details. 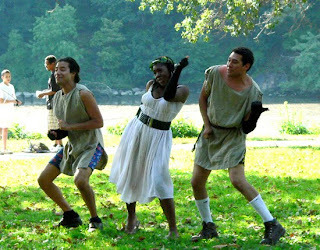 I spent the bulk of the summer in rehearsals for an outdoor production of Aristophanes’ ancient Greek comedy, Plutus, and it seems that wherever our cast rehearsed, a crowd was never too far away. Over the course of the summer months I came to the realization that there was, in fact, something about Plutus that drew and continues to draw people in. Maybe it was the lure of the instruments we played or the attention-grabbing fight scenes, but nearly every rehearsal we found ourselves in performance for a crowd of interested spectators. For me, the most important "crowd" we drew was at an early evening rehearsal in Central Park. Jodie Pfau (who plays the role of Cario) and I were working on scenes with our director, Whitney Aronson, when we attracted the attention of two young girls, one white and one black. The girls appeared to be around seven or eight years old and as Jodie and I (one of us white and one of us black) rehearsed, the two girls sat watching--captivated. The similarity of our pairings was impossible not to notice--Jodie and I even joked that the two girls could have been the two of us 15 years prior. As we continued to rehearse, I couldn't help but think of myself as I looked into the wide eyes of one of our young spectators. When I was a child, the idea of becoming an actor was very far away for me for a number of reasons: I lived in St. Louis, MO and not New York City; I was black; I was too young; I didn't know where to start; and I rarely saw anyone who looked like me actually on a stage--and never in a classical theatrical production. Who knows whether the young black girl who sat and watched our rehearsal that day wants to be actress; it really doesn't matter. What she and her friend saw during our rehearsal is exactly what I love best about Curious Frog Theatre Company. Curious Frog gives its collaborators freedom to break the rules and make new ones. Similarly, I expect and hope that watching us rehearse for those few minutes gave those little girls the courage to do the same in whatever it is that their young minds can imagine. For me, doing a Curious Frog production pairs the joy and challenge of performing outdoor theater with the satisfaction that comes with introducing young people to something new and exciting that may not have been part of their world before. 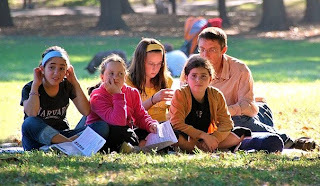 Many of the faces in our audiences have held the same wide-eyed wonder and excitement of that 8-year-old little girl, and after the shows we are thanked for introducing someone to outdoor theater, to Greek comedy, to the classics. Every weekend my fellow actors and I push our voices, push our bodies, endure sweat, dirt, and inclement weather to bring the fantastical world of Plutus to life. In that world, anything is possible: an economy can crumble in a matter of days, the blind can see, slaves are superheroes and gods are guitarists. By depicting that fantasy world we have in turn pulled a new reality into focus for the young people in our audiences. In between the adapted words of Aristophanes is the message that the possibilities for those young children of color are limitless. And the privilege of delivering that message is worth all of the sweat, dirt, and thunderstorms in the world. Lauren Ashley Smith has performed in two Curious Frog productions: "Comedy of Errors" in 2007, and now "Plutus", which can be seen the next two Saturdays at 4pm. For more info, please go to www.curiousfrog.org. One of my fellow cast members confided in me that when he first found out Mercutio was "being played by a girl", he was pretty pissed. I actually felt startled by his admission; what had seemed daring to me a few years ago when I thought of playing the role had since become entirely acceptable in my mind. Even after we were deep in rehearsals, the male cast members had a hard time talking about Mercutio and Tybalt without saying "he" instead of "she", even as they were looking at the me or the actress playing Tybalt. It was fascinating and unexpected from an artistic bunch. The tradition of females playing ostensible male roles is usually most easily applied to Shakespeare's clowns--Feste in Twelfth Night, Ariel in The Tempest, Fool in King Lear--but females playing other traditionally male roles is surprisingly resisted fairly often. A female friend told me she had asked to play Mercutio as her thesis role and the director refused, and ended up casting a male in the role. And certainly there are problems with being cast in other dream roles; while I fervently want to play Brutus in Julius Caesar, what do I do with the role of Portia, Brutus' wife, if I still wish to present a heterosexual relationship? Clearly other factors would need to change in that situation. And while I'm cool with all-male and all-female Shakespearean casts, I've never had a wish to be inside of that experience, but rather remain a supportive patron of those productions. With Mercutio, some factors changed anyway. Unlike Brutus, Mercutio has no such defined romantic relationship. As soon as I started studying the script as a female Mercutio, I wondered if it would work for her to be romantically involved with Benvolio or in love with Romeo, or even both. I saw that there was room for it, if I was careful not to encroach on the obvious main thing about the show--the love of Romeo and Juliet. But why shouldn't Mercutio have feelings of her own, if my job as an actor is to be sure they don't interfere with the story line itself? Nick, the actor playing Benvolio, early on decided to take advantage of this close friendship between these three (Benvolio, Mercutio and Romeo), with a woman in the middle. Since we went contemporary with concept anyway, he wanted to explore the idea that Benvolio had feelings for Mercutio that were stronger than he was letting on, mimicking the experience many of us often have today as male/female friendships become more and more prevalent. As we explored this in rehearsals, it was fascinating how different the scenes would go depending on how covertly or overtly he played those things, and how much I chose to recognize it or even take advantage of it. What an exciting rehearsal process that was for me; to work with the varying degrees and realize how that was informing my character and the friendship between the three, and indeed the play. After one rehearsal where Benvolio and Mercutio were almost constantly touching and holding hands and focused in to each other, Leo (Romeo) commented that it made his Romeo feel more isolated, more alone in his feelings and search for love--a strong application to a quality of that character that is usually ignored. My own use of the text and subtext was great too, and even now as we perform I find the subtleties change every time. Some days my battle of wits with Romeo, and my Queen Mab speech to him, are filled with longing and need, even as I'm not revealing it outwardly to him. Other days I feel so platonic and then the touches of love for him rip through me searingly, much more than if I just let it show. It's made me realize that I have truly settled into the choice that Mercutio wants him as yearningly and secretly as Eponine wants Marius in Les Miserables. Ahhh, drama. In the end, you commonly only hear from those who enjoy the work, with the rare exception of those who so disliked it that they wish to be heard as well. And so, the fact that the response to my female Mercutio has been tremendous is uplifting...and we haven't had a searing letter of disapproval sent to the company....just yet....in spite of the fact that I tumble, cartwheel, and am tossed around by my boys in a short skirt with red skivvies underneath. It's jolly good fun playing this role--it's one of the most challenging roles I've ever played because of the language, the brevity of the character, the antiquated wit I need to deliver; and the physicality of the role; and the combat; and the warring feelings inside of this character; her strength; her confidence; her vulnerability--and I forgot that she was written as a guy in the first place just a few days into rehearsal. But then, I guess that's because Mercutio's not a guy. She's me. I highly recommend all Shakespearean actresses ask to play this role as often as possible. It's a hell of a thing. And I freakin' love it. It is no secret that the life of an actor is in many ways effortful, hard-won, and often dispiriting. I am reminded of the Chekhov short story, ‘In the Graveyard,’ where an embittered and dying actor visits the grave of the man who encouraged him to be a bit player many years earlier. As a person of color there are impediments that I must face, both socially and personally. This is certainly no revelation and this categorically does not entitle me to anything I haven’t worked for. So perhaps you can imagine some of the bottlenecks with the career path I have chosen. It now occurs to me that I shouldn’t have mocked my high school guidance counselor. Now enter Shakespeare. With all due respect to Oxfordians, I would argue that Shakespeare’s plays have opened up a world of thought, imagination, and consummation. And more importantly, Shakespeare saves me the discouragement of thumbing through every audition publication and seeing that I don’t ‘fit’ the role. I can accredit this to the basis that his productions are almost always done with colorblind casting. DOUBLE SCORE! You can imagine my elation when I received the call to play both Benvolio and Paris in Curious Frog’s production of Romeo and Juliet. “Okay, I’ll do them both,” I cried. Shakespeare and the Greeks? Does it get any better? All I really remember from the ancient Greeks is that they believed that their words held up pillars, which in turn held up the universe, and if your words weren’t spoken with enough resolve, purpose, and courage the universe would essentially collapse in on itself. Insert pressure here. My attempts to not sound trite will fundamentally fail because nothing could prepare me for what lied ahead. There was the amicable tug-of-war between both directors as to when I should rehearse for their play. “To be Greek, or to be Elizabethan. That is the Queens or Manhattan question.” The generally low-pitched N train ride to Astoria for R & J, which introduced me to the beauties of Astoria and Off-Track betting I had forgot about living in Manhattan. There was a tremendous sense of community, family, and people in this part of New York, which often seems untapped. And who can ever forget the cast huddled around an air-conditioner battling a New York July, doing text work and scansion? Then of course there was the other side of the Subway Series. Rehearsing for a twenty-five hundred year old comedy written by Aristophanes, who himself once wrote in one of his plays through his Chorus, "producing comedies is the hardest work of all." Rehearsals for this play often led me to a swanky upper-west side apartment, mostly due to remorseless rain. The slapstick comedic bits, underlining themes still relevant today, and the screaming…oh the screaming. “The people living next door are going to burst into this apartment and crack skulls,” I kept thinking to myself. Luckily for us, it never happened. All of this rehearsing, running to and fro, and sweat led to the baptism of something I’d actually never done, performing in the park. There are few things in life more humbling and rewarding then performing in a park. First, there is the responsibility of gathering an audience. For without an audience there is no story to be told. Then, there is the unrelenting heat. Not to mention the animated running, bouncing, hurdling, and leaping in this heat, all while having to constantly change costumes. And lastly, there are the constant barrages. Shakespeare’s English battled plague, famine, and the French. Aristophane’s Greeks fought in the Trojan, Persian, and Peloponnesian Wars. Our wars though not as bloodthirsty, I would argue were just as dramatic. I challenge any actor to attempt to perform in the midst of speed boats, Harley Davidson motorcycles, mosquitoes, the Acela Express, the occasionally aloof and apathetic soul wandering through the middle of the play, house music from an event that requested their park permit on the same day, and did I mention mosquitoes? All posed to be great tests, but forced all the actors to heighten their focus. I found the old Geraldine Page quote to be especially relevant: “If we could only listen to each other on the stage like the animals in the forests do-as though our lives depended on it.” I am convinced without a doubt that at some point Geraldine Page performed in Brooklyn.